Very good history article, thanks to Joe's USHGRS. It brought back a lot of memories of those HG early days and the gliders back then. I just have one question: I also landed 10 feet from the spot (at POTM), where was my mug of beer? Frank Colver wrote: where was my mug of beer? We'd have had one ready ... if we thought you had any chance of surviving the flight. Next time we'll know better. Yeah, I agree, you wouldn't want to chance wasting a good mug of beer. SamKellner wrote: USHGRS the way it should be ! There's your slogan for 2019 Joe!! I spent some time this week with Joe on the USHGRS project. Joe's efforts on this project have been monumental. He's done it all by hand - page by page. I also wrote some prototype software to hopefully make the job easier. As USHGRS grows, I think that will be needed. But what Joe has done so far - all by hand - is truly impressive. I couldn't find a link to the actual episode but it was filmed in early 2012. If the video is online, it would be nice to add a link to Dave's page. 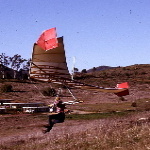 Dave Beardslee put hang gliding on center stage in a popular national television show. just had his H3 certified by USHGRS. report. Will post to file. For months USHGRS has posted on its site "Sponsor Opportunity Here" in some spaces on the site. Some message about that was sent to some HG businesses. A first sponsor has purchased a front-page spot. 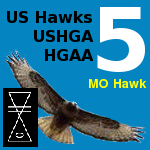 The US Hawks forum took the spot. Other spots are still available. HG instruments? Instructors? Schools? Harness makers? etc. are generally invited to take other spots. Send USHGRS a known membership number (local, national, universal) of a pilot who has HG flown in US airspace. Check first if USHGRS has the pilot's Pilot Page up already. Second level of teaming help: Send interest links that are related to the pilot. Thanks to those that are do such already!